I'm doing some code generation based on the standard org sObject metadata. As part of that process I'm using the DescribeSObjectResult.fields.picklistValues PicklistEntry records to determine which values can be assigned to a picklist field. These aren't dependent picklists. The validFor field is null. This affects both the REST and SOAP API metadata equally. Note how ConnectedApplication appears in two identical records. I've tested API versions in the range v35.0 through to v44.0 and found the same results. Any ideas on what's causing the duplicates? Since the API values are identical between the records there isn't much I can do to distinguish between them when calling the APIs. As such, this may affect Lightning Components, Visualforce pages, external pages generated from describe calls, etc. You may want to report this as well. Interestingly, the "values" for all picklist values render as null instead of the correct label. 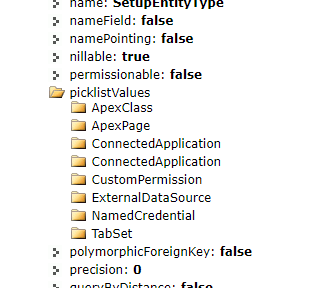 In other words, any code that tries to describe these picklists will just see lots of null values in their picklists. Not the answer you're looking for? Browse other questions tagged rest-api soap-api picklist metadata or ask your own question. Why are my default values always null for checkbox/boolean fields? How do you retrieve which “Type” each Opportunity StageName value is with the REST API? How can I delete picklist values via the metadata API? How to handle different translations of a picklist value on If Conditions?